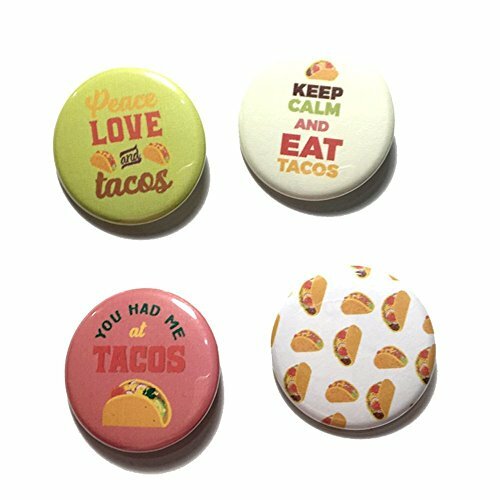 These pins are great gift for party favors or taco addicted! This listing are for 12 pcs badge pin quality product. **There will be no glare in the real product, it's because photo lighting** The pin you'll get: 3 pc taco pattern, 3 pc keep calm and eat tacos, 3 pc peace love and tacos, 3 pc you had me at tacos SIZE Pin size 1 1/2" or 2.25" diameter. It's hand cut and hand pressed. This item are Made To Order, usually take 2 days before ship out. If you have any questions about this product by Party Quine, contact us by completing and submitting the form below. If you are looking for a specif part number, please include it with your message.